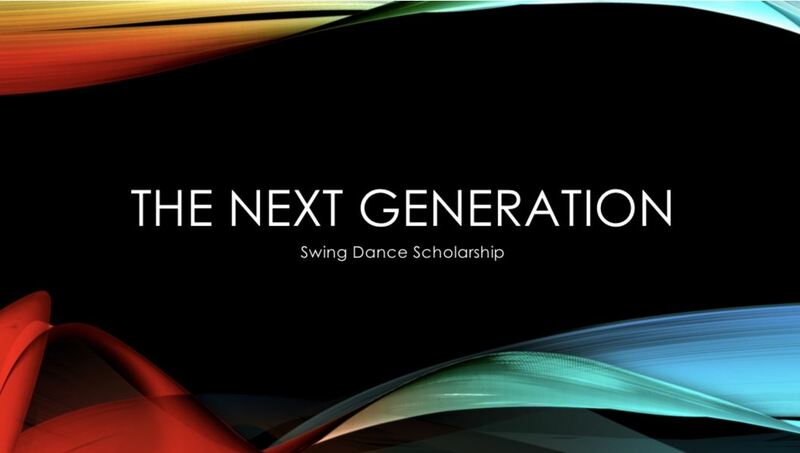 The Next Generation Swing Dance Club Dance Scholarship aims to promote West Coast Swing, its current community, history, and upcoming community leaders and builders by providing opportunities to individuals looking to expand the exposure of West Coast Swing. By enriching the quality of individual involvement and investing in the future of West Coast Swing, we are looking to help provide awareness of West Coast Swing to non-dancers as well as help ensure the longevity of California's State Dance. We will be open to accept scholarship applications NATION-WIDE on March 1st, 2019! Dancers can be current competitors or non-competitors. There is no limit on age, gender, dance level, or dance role (lead/follow). Community presence/contribution in both the outside communities and within the dance community. Meaningful goals pertaining to dance. Amount of effort spent on achieving dance goals. A committee of respected WCS Champions, past Scholarship recipients, and WCS elders will be selecting form applicants. All applications with be made anonymous previous to being given to the Selection Committee for consideration. 2019 Boogie by the Bay event passes INCLUDING Jordan Frisbee and Tatiana Mollman additional Intensive. 2019 Swingtacular event passes, travel, and hotel. 2019 All Star Swing Jam event passes. 2018 Swing California event passes. Judging Mentor-ship with Andy Bouman. Judging Mentor-ship with Kelly Casanova. DJ Mentor-ship with Ray Byun. Teaching Mentor-ship with Nick Jay. Private Lessons with Tara Trafzer. One year free Next Gen Swing Dance Club Membership. One year free Capital Swing Dancers Club Membership. $150.00 Gift Certificate to Dance Connection. $150 Gift Certificate to Dance Connection. As part of the scholarship package, winners will receive event passes to 2 events of your choice, (of available options), and you will be expected to attend both of these events, as well as share your experience. When representing TNGSDC at a dance event, you will abide by the Boogie by the Bay Code of Conduct. Violations of the Code of Conduct will result in revocation of the scholarship award. You are expected to create monthly dance blog posts, including photos and/or videos, sharing your experience at various dance events that you attended, as well as any dance highlights or struggles you experienced that month, and any tips you'd like to share with the dance community following your journey. These posts will be used to help promote any upcoming/current events you are interested in attending. Your full scholarship application will be posted online for the community to view, so make sure your answers are accurate. False statements will be disqualified, resulting in revocation of the scholarship award. applications can be emailed directly to us! To apply, complete the PDF application. Include all materials you wish to be considered in your application package. (Photos, DVDs of performances/dancing, references, etc). These items will be used for screening applications before being moved into the selection process. Photos will be altered to remain anonymous, and DVDs removed, when applications are sent to the Selection Committee.